Desert Falls Country Club was established in 1984 and is the self-proclaimed “friendliest club in the desert.” This gated golf community boasts scenic mountain views and a challenging and enjoyable 18-hole championship course designed by Ronald Fream. The club is owned by the nationally acclaimed Club Corp of America and is listed as one of the top 10 golf courses by the SCPGA . The 35,000 sf Clubhouse, and the golf course, are the heart of the Desert Falls community. The course distinguishes itself from many others in the region with its ample distance from the tees, massive greens and undulating fairways. Also featured are a driving range, practice greens, locker room and showers, pro shop, golf club rentals and a friendly professional staff to help you with your game. For non-golfers, there are 9 night-lit, hard surface tennis courts, fitness center complete with racquet ball courts, and 32 swimming pools (with 3 lap pools). Desert Falls Country Club is centrally located close to the El Paseo Shopping District, restaurants, live entertainment and many other desert activities. The I-10 freeway can be easily accessed in twenty minutes by car and the Palm Springs International Airport is a quick half hour away. 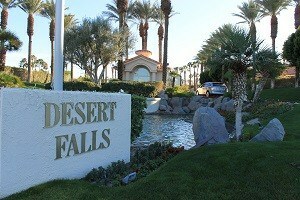 Desert Falls Condos – Single and two story Condos. HOA dues from approx. $435 to $496/mo..
Desert Falls ‘The Links’: Higher end single family residences in gated enclaves within guard gates of Desert Falls Country Club. These single family homes, most with private pools, are priced from approx. $250,000 to approx. $600,000. HOA dues are approx. $435 to $496/month. Desert Falls ‘The Estates’: Higher end single family residences in gated enclaves within guard gates of Desert Falls Country Club. These high end custom single family residences are priced from approx. $1,400,000 to approx. $1,500,000. HOA dues of approx. $350/month. Location: Front entrance off of Hwy. 111 between Cook St. and Eldorado Dr. Other entrances off of Cook and Frank Sinatra Dr. Golf Membership: approx. $13,000 (includes full social membership privileges and the active social calendar offered by the club).